Less than a week after ending on eBay without an opening bid of nearly $25,000, the 2011 Bowman Bryce Harper Superfractor is back on eBay. This time, it should be a little more exciting to watch as the seller has listed it without a reserve and a lower opening bid. In fact, within 24 hours of the auction's start, the card reached more than $12,000 on over 40 bids. The one-of-one is graded 9.5 by BGS with sub-grades of 9 for centering, 10 for edges, and 9.5 for both corners and edges. 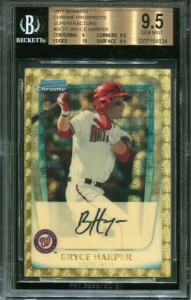 The 2011 Bowman Bryce Harper Superfractor was originally listed last month with an opening bid of $24,999. Despite getting mainstream media attention with a story on Yahoo's Big League Stew and Harper getting called up to the Nationals, it still did not receive a bid. That said, it did receive 143 offers. However, last week the original seller closed a private sale for the 2011 Bowman Bryce Harper Superfractor and the new owner appears to be trying to flip it for a quick profit. This explains a couple of differences between last month's listing and the current one. Besides the change going from a high opening price to a low one, the seller IDs changed. Also, the original listing was based in California while the new one is in Missouri. Most notable of all is that the new seller, Kevin Thole, has a low feedback rating of 3. We did contact both Thole and the original seller and both mentioned the private sale of the 2011 Bowman Bryce Harper Superfractor that led to the current listing. "Yes, we only have 3 feedback," Thole said via email, "but we are completely verified and are confident that it shouldn't matter too much." Thole said that he was hoping the Harper Superfractor would pass the 2010 Bowman Stephen Strasburg Superfractor, which last sold for more than $21,000. The 2011 Bowman Bryce Harper Superfractor auction ends on Wednesday, May 16 at 6:30 PM Pacific. Bryce Harper 2012 Signed Black Baseball Rare Rookie Year JSA LOA Bible Verse.